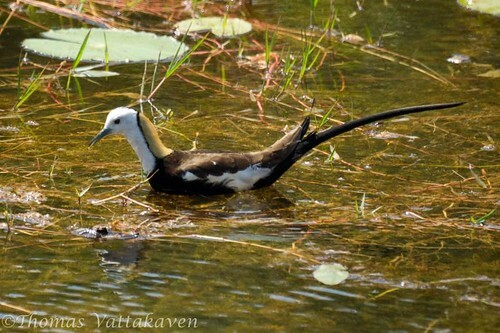 Driving down from Bangalore, on our way to Mekedatu, it was my wife who spotted this beautiful bird in a canal by the road side near Kanakpura. 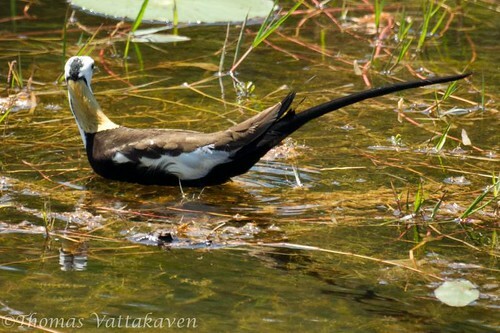 This is the Pheasant-tailed Jacana (Hydrophasianus chirurgus), a member of the Jacanidae family. There are about 8 different species in this family and this one is arguably one of the most eye-catching. What sets it apart is the long sickle-like tail. It is only the breeding adults which have the tail and the non-breeding birds lack it. 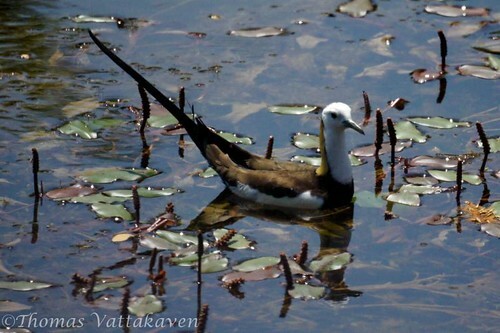 This is the only Jacana with a different breeding plumage. The body is mainly blackis-brown, other than for its white wings, head and the foreneck. Another distinctive feature is the golden coloured patch on its hind-neck, which looks as it it was added on as an afterthought! 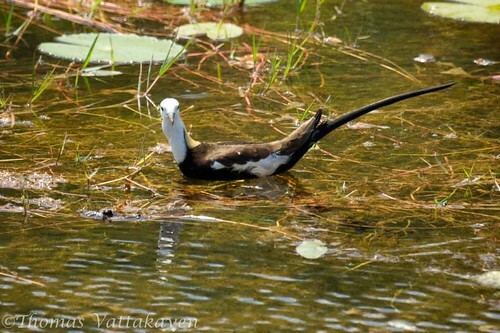 In non-breeding adults apart from lacking the long tail, the under parts are white except for a brown breast band and neck stripe. The side of the neck is golden. 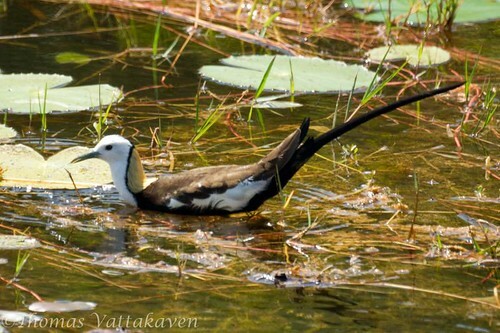 These birds have huge feet and claws, which enable them to walk on floating vegetation in shallow lakes, which is their preferred habitat. 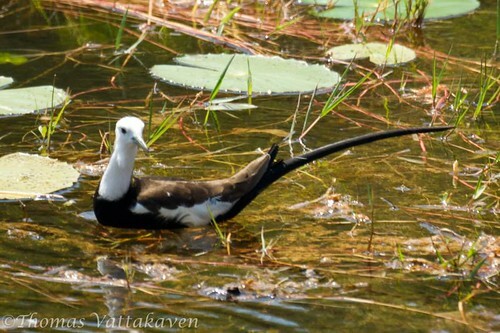 I haven't been able to get a picture of their feet as this bird never got out of the water where it was feeding. 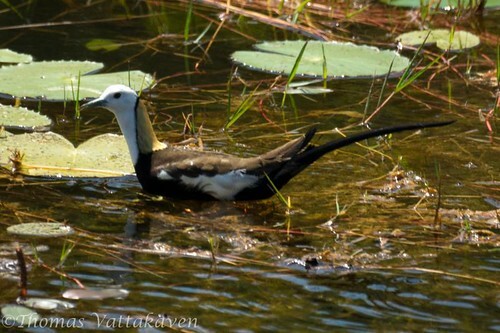 While they can swim, they are mostly content walking among the floating vegetation in the water, from where they pick up insects and other invertebrates. 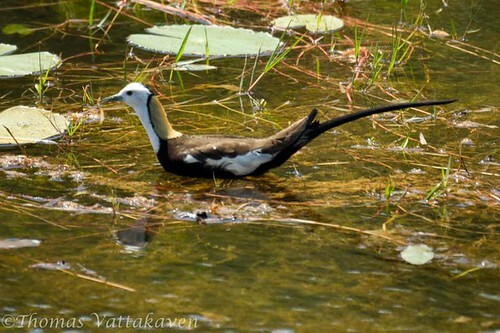 They breed on the floating vegetation from March to July or in the Monsoon season. The birds are polyandrous, meaning that a female has more than one male partner at the same time! A female, which is bigger and more colourful, may lay up to 10 clutches of eggs, but it is the male who takes care of the eggs and young, while the female wanders to find another mate! 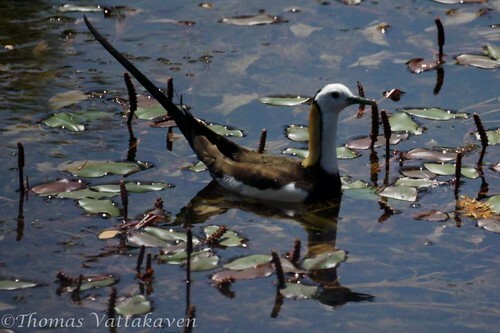 It is not a great thing to be a male Pheasant-tailed Jacana!